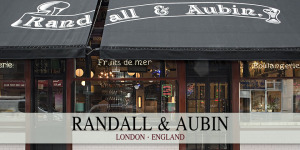 Randall & Aubin on Brewer Street, has been satisfying appetites since 1911. 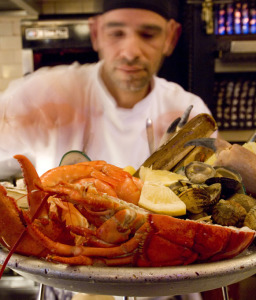 In the vibrant heart of Soho, the restaurant is one of London's landmark seafood restaurants. Formerly a butcher's shop, key elements of the original decor have been retained and the white tiled walls and marble topped tables create a wonderful, unique dining atmosphere with subtle clues to the past. A bountiful seafood counter packed with fresh produce tempts you on arrival - oysters, lobsters, prawns, mussels, whelks, crabs, langoustines and clams. Savour a platter of the fruits de mer or if this is too much try a smaller 'assiette'. The menu extends to a full carte with queen scallops, calamaris, gravadlax, and tuna Nicoise amongst the starters. Mains range from fish and chips to grilled sea bass. Meat from the rotisserie includes belly pork, Goosnargh chicken from Lancashire and succulent Montague lamb from Oxfordshire. Friendly but professional young staff keep service on the ball and the place buzzing. It's a great place to unwind, listen to modern music, and watch the Soho world go by.